Our new Sky Fire bundle is inspired by the new Run Wild Quilt by Then Came June. The quilt is also attached to the bottom of this listing. Featuring Cotton Supreme Solids in every shade of the sunset that you've come to know and love form Then Came June. Melody, Hot Pink, Antique Rose, Verbena, Ballerina, Muslin, Just Peachy, Flamingo, Tropicana, Pumpkin, Butternut, Saffron, Mustard, Citron, Lemon Chiffon, Cove, Poolside, Lake, Bora Bora, and Harbor. Choose to order yardage by entering a quantity of quarter yards or fat quarters from the drop-down menu above! All fabric is cut in one continuous piece. We created this beautiful bundle of Cotton Supreme Solids in tones you'd find on the California Bluffs for Village Bound Quilts. This bundle includes 16 colors for her latest pattern Sonoran Chain Quilt. The Sonoran Chain Quilt Pattern by Village Bound Quilts releases at the end of April. 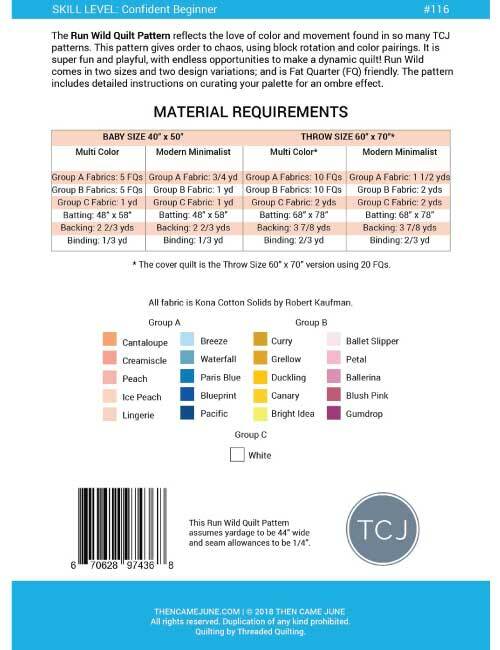 Please note, this listing does NOT include background fabric, backing fabric, or the pattern. Village Bound Quilts uses 2 yards Freckles in Sandcastle, and 1 yard Cotton Supreme Solid in Swan. Run Wild Quilt Pattern by Then Came June The Run Wild Quilt Pattern reflects the love of color and movement found in so many TCJ patterns. This pattern gives order to chaos, using block rotation and color pairings. It is super fun and playful, with endless opportunities to make a dynamic quilt! Run Wild comes in two sizes and two design variations; and is Fat Quarter (FQ) friendly. The pattern includes detailed instructions on curating your palette for an ombre effect. This pattern requires beginner quilting knowledge. The pattern assumes quilter has knowledge of basic piecing and can use consistent 1/4" seam allowances. The pattern requires yardage and/or FQ. Material requirements on second image.